This round, ferrule end brush is produced with stainless steel fill, long trim and a twisted wire loop handle. We offer two standard brushes with either 9" or 18" overall lengths. 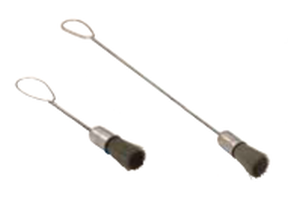 These brushes are ideal for removing metal chips in parts cleaning applications, especially in high temperature applications.